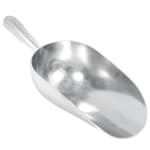 Perfect for scooping ice and portioning ingredients, the Winco AS-12 scoop has a 12-ounce capacity. Its aluminum construction is heavy duty and resistant to corrosion. To prevent damage to the material, the scoop should only be washed by hand.